We are a leading Manufacturer of double door cage bins, all side closed cage bins, steel cage bins, double sided door cage bins and safety cage bins from Thane, India. To keep the client satisfied, we manufacture and supply high quality Double Door Cage Bins that finds its wide application in different industry. Our skilled professionals use optimum quality raw material and advanced technology, while manufacturing this cage bin. We offer this cage bin to our clients after testing it against various quality parameters. Moreover, this cage bin can be availed in various sizes and designs at affordable prices. Our organization has gained recognition as a flourishing enterprises for providing All Side Closed Cage Bins. 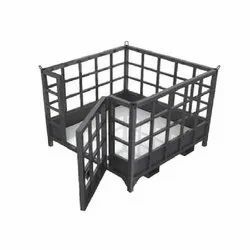 Empowered by a technologically-advanced infrastructural base, we are able to offer premium quality range of Steel Cage Bins. 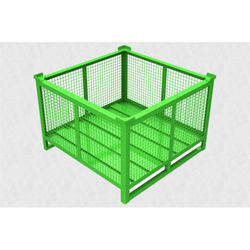 The offered cage bin is designed using quality proven raw material and the latest technology under the vigilance of our skilled personnel. 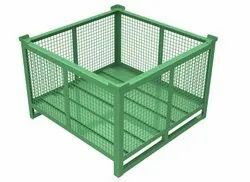 Furthermore, our provided cage bin is sternly tested against different parameters to ensure zero defect delivery at the users’ end within the set time frame. Leveraging on our vast industrial experience in this domain, we are devotedly engaged in offering an extensive array of Double Sided Door Cage Bins. The offered cage bin is designed by using high grade raw material and ultra-modern technology under the supervision of adroit professionals. We provide this cage bin to our clients in diversified designs and shapes in order to cater the demands of our clients. 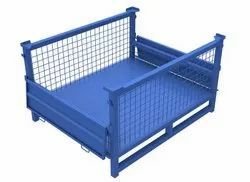 We are offering elegant range of Safety Cage Bins. Designed using premium quality raw material and cutting edge technology under the guidance of adroit professionals, these cages are highly praised in the market. Our offered cages can be customized in various sizes and designs in order to cater the wide requirements of the clients.